The Süleymaniye crowns one of İstanbul’s seven hills and dominates the Golden Horn, providing a landmark for the entire city. Though it’s not the largest of the Ottoman mosques, it is certainly one of the grandest and most beautiful. It’s also unusual in that many of its original külliye (mosque complex) buildings have been retained and sympathetically adapted for reuse. Commissioned by Süleyman I, known as ‘the Magnificent’, the Süleymaniye was the fourth imperial mosque built in İstanbul and it certainly lives up to its patron’s nickname. The mosque and its surrounding buildings were designed by Mimar Sinan, the most famous and talented of all imperial architects. Sinan’s türbe (tomb) is just outside the mosque’s walled garden, next to a disused medrese (seminary) building. The mosque was built between 1550 and 1557. Its setting and plan are particularly pleasing, featuring gardens and a three-sided forecourt with a central domed ablutions fountain. The four minarets with their 10 beautiful şerefes (balconies) are said to represent the fact that Süleyman was the fourth of the Osmanlı sultans to rule the city and the 10th sultan after the establishment of the empire. In the garden behind the mosque is a terrace offering lovely views of the Golden Horn and Bosphorus. The street underneath once housed the mosque complex’s arasta (street of shops), which was built into the retaining wall of the terrace. Close by was a five-level mülazim (preparatory school). Inside, the building is breathtaking in its size and pleasing in its simplicity. 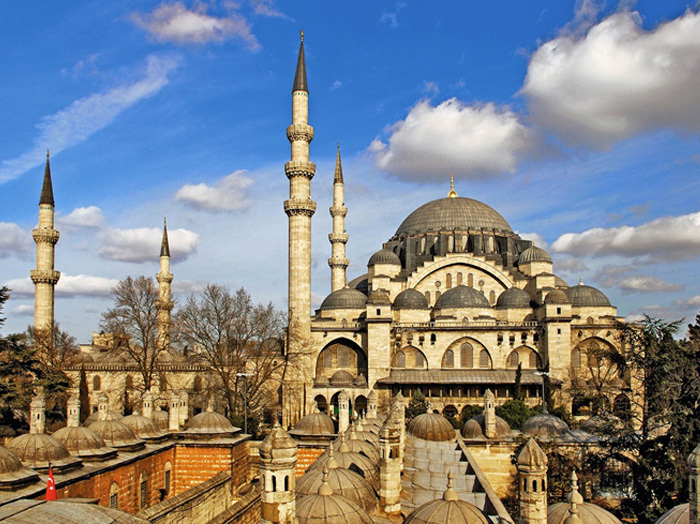 Sinan incorporated the four buttresses into the walls of the building – the result is wonderfully ‘transparent’ (ie open and airy) and highly reminiscent of Aya Sofya, especially as the dome is nearly as large as the one that crowns the Byzantine basilica. The mihrab (niche in a minaret indicating the direction of Mecca) is covered in fine İznik tiles, and other interior decoration includes window shutters inlaid with mother-of-pearl, gorgeous stained-glass windows, painted muqarnas (corbels with honeycomb detail), a spectacular persimmon-coloured floor carpet, painted pendentives and medallions featuring fine calligraphy. Süleyman specified that his mosque should have the full complement of public services: imaret (soup kitchen), medrese, hamam, darüşşifa (hospital) etc. Today the imaret, with its charming garden courtyard, houses the Dârüzziyafe cafe and is a lovely place to enjoy a çay. On its right-hand side (north) is a tabhane (inn for travelling dervishes) that was being restored at the time of writing, and on its left-hand side (south) is Lale Bahçesi, a popular tea garden set in a sunken courtyard. The main entrance to the mosque is accessed from Professor Sıddık Sami Onar Caddesi, formerly known as Tiryaki Çarşışı (Market of the Addicts). The buildings here once housed three medreses and a primary school; they’re now home to the Süleymaniye Library and a raft of popular streetside fasulye (bean) restaurants that used to be teahouses selling opium (hence the street’s former name). On the corner of Professor Sıddık Sami Onar Caddesi and Şifahane Sokak is the darüşşifa, also under restoration. The still-functioning Süleymaniye Hamamı is on the eastern side of the mosque. To the right (southeast) of the main entrance is the cemetery, home to the octagonal tombs of Süleyman and his wife Haseki Hürrem Sultan (Roxelana). The tile work surrounding the entrances to both is superb and the ivory-inlaid panels in Süleyman’s tomb are lovely. The streets surrounding the mosque are home to what may well be the most extensive concentration of Ottoman timber houses on the historical peninsula, many of which are currently being restored as part of an urban regeneration project. To see some of these, head down Felva Yokuşu (between the tabhane and Sinan’s tomb) and then veer right into Namahrem Sokak and Ayrancı Sokak. One of the many Ottoman-era houses here was once occupied by Mimar Sinan; it now houses a cafe. Alternatively, from Professor Siddık Sami Onar Caddesi head southwest into narrow Ayşekadin Hamamı Sokak (it’s hidden in the middle of the souvenir stands) and follow it and Kayserili Ahmetpaşa Sokak down through the Molla Hüsrev district, which is slowly being restored as part of the Süleymaniye Urban Regeneration Project. Kayserili Ahmetpaşa Sokak is home to a number of pretty timber houses built in the late 19th and early 20th centuries.